Today there are drones for everyone, at all experience levels, and for all age groups. Even youngsters can get in on the action now. This is thanks to a whole new range of drones for kids. Drones for beginners are not always suitable for kids under a certain age if the maker targets them at the older novice. Purpose-built drones for young people have designs that make flying them easier. The last thing a kid wants to experience with their new drone is frustration and discouragement. None of the picks in this guide will cause these upsets. Children have been interested in flying objects forever. Competing with paper airplanes has always been a great way to have fun. And kite flying continues to be popular. Now we have kid’s drones as ‘the next best thing’. They certainly provide heaps of fun. They can also help kids learn something about the technology and mechanics of their new flying robot. Fun and crash resistant drone for kids with no camera. Programmable drone with good flight time. Decent camera plus extra batteries included. Most drone manufacturers will include child safety guidelines with their flying toys. These include things like manufacturer recommended age and whether supervision is necessary or not. If there are any tiny detachable parts then the toy drone maker will include a small parts warning. Always read the safety instructions carefully before giving your child control of the craft. I add these specs in a table at the end of each review. If you want more details, follow the best price links at the end of each review. I also list any pros and cons for each model in the same table. Most lightweight toy drones for kids don’t need Federal Aviation Administration (FAA) approval. It’s a quick and painless procedure for drones that do need FAA registration, though. Note that FAA periodically reviews and updates its rules and regulations on consumer drones and quadcopters. It’s the responsibility of all drone owners to stay updated on these laws. For more details on drone legalities, read my easy-to-follow guide: Before You Fly Your Drone. Even a small drone can become an out-of-control flying missile in the wrong hands. It’s why there are legal responsibilities that come with flying UAVs, especially outdoors in public spaces. You need to think about the child’s age when choosing a drone. A 16-year-old, for example, may not want the same product you’d choose for a 5-year-old. That brings me on to my next point. 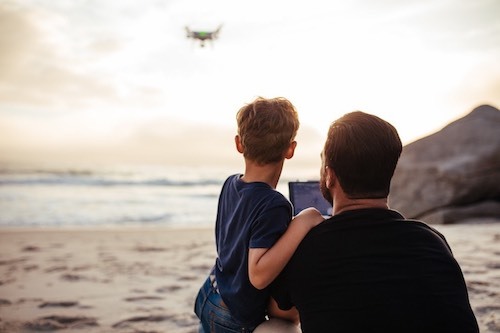 Always supervise very young children with a drone even if they demonstrate impressive piloting skills. Most drone manufacturers recommend 12-14 as the minimum unsupervised age. Even tiny nano and micro toy drones have fast moving propellers and small parts that an inquisitive toddler could choke on. Most of these toys are safe to fly indoors as well as outside—under supervision. Consumer drones are becoming the most sought-after kid’s toy of all time. They’re heaps of fun too. The youngsters of today are the drone pilots of tomorrow and we want them to get good. Have an idea of what you want for your kid before you make a decision to buy. Some of the tiny crafts are incredibly cheap but you still want to make the right choice. That’s what this guide is all about. Keep the age of the child in mind so that you can shortlist your options. Do you want a camera with the drone of just a craft for flying only? Flight controller: is it physical and included, an extra cost, or a mobile app? I’ve included some low budget drones for kids in these reviews, plus one in the mid-price range, and everything else in between. By the end of this guide, you’ll be able to make better-informed decisions. I’ve also arranged these reviews in order of price category—cheapest first to most expensive. 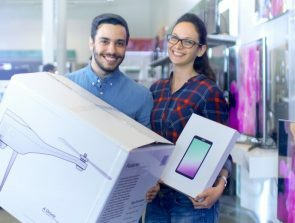 The categories are under $50, under $100, and one midrange drone for the more experienced teenager. The table below shows the most popular drones for kids at the time of writing this buyers’ guide. This guide contains no-nonsense reviews for eight of the most popular drones for kids. There are others—many others—but these are the ones that have proved to be winners among younger pilots. Don’t let the low price of these drones put you off. It’s amazing how well these crafts fly and how robust they are. Seriously, you get a lot of bang for your hard-earned buck here. I’ve organized each model by Editor’s Rating—highest to lowest. These are not simply ratings based only on my opinions. I also take real user feedback into consideration and expert views. 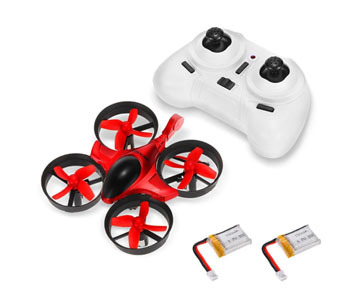 This nifty little quadcopter is a perfect drone for kids and anyone else at the entry-level. It’s from the mini category of smaller drones which means it’s about the same size as an adult’s hand. What we have here is a fast and fun quadcopter for youngsters. The manufacturers recommended minimum age is 14 years. It means adults should supervise younger kids who want to fly. The Holy Stone HS170 has a high rating on Amazon and thousands of positive reviews from users. It’s reassuring to know that others have flown the drone and rave about its features and capabilities. The Holy Stone HS170 is easy to grasp and a great drone to learn from. It comes with a headless mode or carefree mode. This is great for newbies as you don’t have to differentiate the front from the back. There are three Speed Modes and the slowest is perfect for beginners. The super-fast mode gives plenty of fun for more advanced drone pilots. Be mindful of the speed options when flying indoors. Take advantage of the 6-Axis Gyro Technology and perform impressive rolls and flips with a little confidence and experience. This is all push-button flying so nothing here is too complex. You control the Holy Stone HS170 with its 2.4G remote controller (included). It’s a simple yet practical design that fits neatly in the hands. The only problem with the RC is that the buttons are unmarked. You’ll soon work out which button does what function. Even so, it’s a bad design flaw on what would otherwise have been the perfect kid-friendly quadcopter—for the money at least. You can fly 80m from the controller and for as long as 8-minutes in ideal conditions. That doesn’t sound long but it’s an average time for a drone in its class. Always carry a spare battery or two. Recharge time is about one hour. I’d suggest swapping batteries before they run out of power for optimal control. You can also upgrade the battery to a Lithium-Polymer to improve the flight time. The Holy Stone HS170 doesn’t come with a camera. Kids who want to get into aerial photography and filming can look at the other options in this guide. The drone is primarily a fly-only robot. This is a robust little craft despite its small size and lightweight. It will stand up well to a few collisions and crash landings. If you do damage the propellers it’s nice to know there’s a spare set in the box. The other great thing worth pointing out is the availability of spare parts if you need them. My main disappointments are the unmarked buttons on the RC and the overly basic user guide. Overall, though, there’s very little to beef about for 40 bucks. This kid’s drone is tough, it’s user-friendly, and it has some great flight modes. It can also perform a few impressive stunts. The GoolRC T36 Mini is a kid’s drone that looks pretty toy-like. That makes it appealing to younger children in particular. Despite this, it’s still a fun craft for anyone at the entry level. 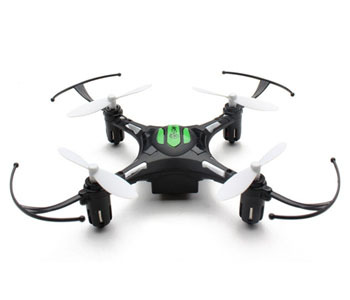 Because it’s mini lightweight RC quadcopter it’s perfect for the indoor environment. It’s also ready to fly (RTF) right out of the box. The makers recommend a minimum operating age of 14 years. You have to be careful if you fly this drone outdoors. Its small size means it’s easy to lose in bushes, long grass, trees, and other spaces where there’s a lot going on. It’s best to fly in clear open spaces. It may be necessary to fine-tune the way the craft responds to the controls before taking to the skies. That means left, right, forward, and back tweaks. The manual explains how to do all that. You might find this drone a bit fast and fiddly if you’ve never flown a drone before. It’s certainly got a lot of power for a tiny machine so it does take a bit of getting used to. The remote control (RC) is also light and toy-like just like the drone. It works well, though. Anyone who’s comfortable with a standard video games controller will have no problem getting used to it. It doesn’t take long for kids to get comfortable with both the drone and its controller. It even has a 6-axis gyro flight control system. This helps to keep the GoolRC T36 steady in the air. Once you’re comfortable flying around you can then move on to 360° flips and rolls. The pilot achieves these fancy moves using a single key. That makes them easy to perform yet impressive to watch. There’s no need to panic if you lose sight of the drone as it has a handy inbuilt positioning system. The single press of a ‘Return’ button brings it back to base—as long as there’s still power in its battery. At just 5-minutes the flight time of the T36 Mini is not so good. They do include a bonus battery which in effect gives you 10 minutes in the air. The charging time is around 50 minutes which is quite fast. The control range is about 30m. With a drone this small you won’t want to fly it any further than that. It’s also plenty of distance to buzz around inside most houses as you perfect your piloting skills. The GoolRC T36 Mini is a great choice for kids who want to explore the consumer drone phenomenon. It’s robust too. That means it can take a few of those inevitable knocks, crashes, and collisions. 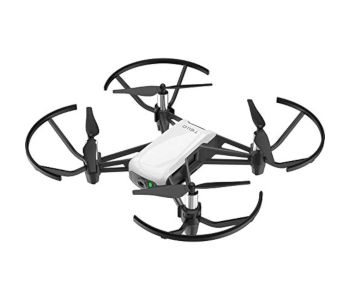 It’s not a feature-rich quadcopter but then it couldn’t be for a drone in this price range. I see it as a great learner craft. Seriously, get good at flying the T36 and you’ll be ready to move on in no time. The Syma X5C-1 Explorers is a value-for-money flying quad for kids. It’s a bigger drone than the previous pick. It’s still lightweight and easy to handle for flying safely indoors as well as outside. This drone comes with an HD camera (removable) and we’ll be looking at that in more details shortly. It’s the perfect gift for any kid looking to get into aerial photography and shooting video. The manufacturer’s recommended age for flying this drone unsupervised is 14 years. When the new drone arrives it’s almost ready for you. You can put the propeller guards on (optional) and the batteries into the remote controller. You’re now the pilot in charge and ready to fly. The most important feature for any kids drone—especially the first one—is its ease of use. 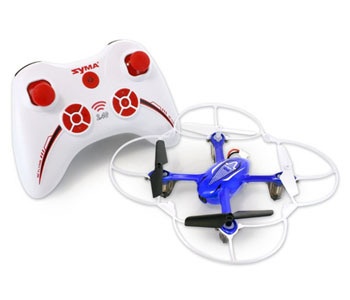 Well, the Syma X5C-1 is simple for children to control, a smooth flyer, and a real showoff in the sky. The 6-axis Gyro stabilization helps to steady the craft making it more flexible and wind-resistant. The modular design structure provides simple assembly and aids easy maintenance. As with the first pick, there’s not much to complain about for the money. The flight time is a bit below average at 7-minutes. The biggest gripe is that the battery takes a long time to charge. The battery recharge time is at least 90 minutes so it’s not impressive. It’s always a good idea to take an extra couple of fully-charged batteries with you when you go flying. The 2.4G transmitter is pretty ugly but perfectly functional. The control sticks are spring loaded and feel nice to the touch. There’s even a small LCD display at the bottom which shows status indicators. There are about nine control options to help you fine-tune your flights and operate the camera. Control distance from the transmitter is 30 meters. The small 2MP HD 720P camera won’t win any awards. But then most kids are not overly fussed about exceptional footage anyway. It’s still a great first camera drone for youngsters to practice with. You can remove the camera when you’re just flying for fun. The lighter payload will give you a little more flight time and agility so it’s a handy feature. The average flight time is around 7-minutes. In summing up, I recommend this as a great first camera drone for children. It’s fun to fly, easy to control, stable in the air, and can take a few knocks. It’s certainly an affordable choice. This is one of the cheapest Kids drones around but don’t let its low price tag deter you. There’s a lot of good stuff going on with this 7-ounce Eachine H8 Mini quadcopter. It’s a good looking craft too. The manufacturers recommended minimum age is 12 years. That’s two years younger than most of the drones on this page. It suggests that children under 12 have someone older to supervise them. That’s about it—a few bits for a simple craft. OK, let’s see how she performs in the air. The plastic materials used in this drone are quite strong despite the cheap price. There are propeller guards too. They do a reasonable job protecting the drone from those beginner crashes. Start flying on the 40% flight mode. Not even an experienced pilot could control this little beaut on 100% flight mode out of the box. The yaw-rates (angle/rotation speeds) are off the charts at 100%. Flying on the 40% flight mode provides plenty of fun and stable flying experiences. The 360° roll-over lets you perform some impressive flips and rolls with the effortless push of a button. The Headless Mode also makes flying easier for young pilots. It allows them to maneuver the drone using its controller without worrying about the direction of the craft. There are also four colorful LED lights if you fancy flying the H8 Mini in the dark. These lights look pretty but they also serve a purpose. They make it easy to recognize the craft’s orientation at night. The remote controller is nothing fancy but it’s big enough and easy enough for kids to get to grips with. You can change the stick tops to make controlling the drone easier for larger hands. At 6-7-minutes the flight time is standard for a tiny quadcopter like this one. That’s not long to have fun so make sure you invest in a couple of extra 3.7 V 150 mAh batteries if you want more time. The battery recharging time is a reasonable 45 minutes with the USB cable (included). The flying distance is 30m which is average. If you try to fly further than that the motors will stop. This auto-cutout feature is a good thing as it prevents those dreaded flyaways. The Eachine H8 Mini is lightweight (just 20g with the battery). That means there’s little risk of damage if it falls onto a soft grassy surface. When you first unbox this cute little quad you’ll wonder how Eachine can offer so much for so little. It really is a value-for-money kids drone. The only major gripe is its high yaw-rate. I wouldn’t suggest it for anyone under ten as it takes more skill to fly than some of the others in this guide. It’s a small investment, though, for an amazing RTF drone this fast, this stable, and this cheap. The Syma X11C is the last of my kid’s drones for less than 50 bucks. 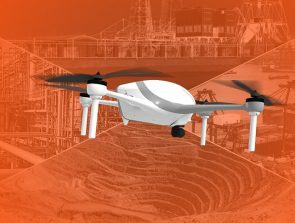 Syma is renowned for producing quality drones at affordable prices. The makers suggest supervision for anyone under the age of 14. You not only get a low-cost drone but one that boasts good quality too. By quality I mean for its class and the craft’s durability. It obviously doesn’t use the same materials as costlier drones. This great little flyer also sports a tiny 2-megapixel camera. The Syma X11C provides an affordable opportunity for kids who want to try their hand at aerial filming. This is a nice stable camera drone in the air—even in blustery conditions. That’s something to think about if you intend to fly quadcopters outdoors when it’s windy. Not all drones can hack it. Once you’re familiar with the controller and drone you can take your maiden flight indoors or outside. Everything is straightforward. The craft is a smooth flyer and responds well to commands. It’s also durable—crash resistant—up to a point. Minor accidents are unavoidable, especially with kids just starting out. I suggest novice pilots keep the blade protector on until they’re more competent. The flying features include a one-key 360° roll for performing impressive aerial tricks and flips. The transmitter is quite basic and fits nicely in the hands. It’s very similar to an Xbox controller. The inbuilt 2MP camera shoots reasonable quality footage considering the price of the X11C. It’s not awesome but it’s good. It gives kids a great introduction to aerial photography and videography. The camera does nothing to impress indoors or outside in low-light conditions. But don’t forget you’ve got a flying camera quadcopter for less than 50 bucks. It’s important to have realistic expectations. A fully-charged battery gives between 7-8 minutes flight time in optimal conditions. If you’ve read the other reviews you’ll know this is about average. Make sure you buy one or two extra batteries. The recharging is done via USB (cable included) and takes anywhere between 40-50 minutes. The control range of the Syma X11C is around 30 meters. Again, this is about average for a small craft. 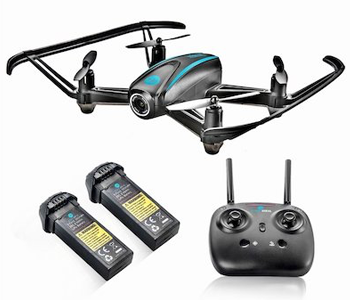 There’s no doubt that this smart little camera drone is exceptional value for money. It flies really well and responds to the controller seamlessly. Any kid who’s had a games controller in their hands will master this one without any problems at all. Check out the specs, pros, and cons below to see if the Syma X11C checks enough of your boxes. The drones in between $50 – $100 have a few more bells and whistles than the previous picks. There’s not a lot between some of them, though, so make sure you don’t pay extra for what you don’t need. If you plan to fly indoors always opt for small craft from the nano or mini-drone categories. Note that some nano drones are too small to fly outdoors. They’re far too lightweight and very easy to lose. The DJI Ryze Tello is a terrific little quadcopter for kids. It’s not only a fun drone, it’s educational too. Young pilots can control this puppy using a regular smartphone or a laptop computer with a coding system called Scratch. Don’t let that scare you. Scratch allows kids to easily create new features and functions using Tello’s SDK (Software Development Kit). The Tello is a super easy quad to fly for kids at the entry-level, but it’s not only for youngsters. The tiny drone has enough advanced features to keep older pilots entertained too. All you do to start flying the Tello is throw it into the air and away you go. There are plenty of other kid-friendly flight features as well (see below). The long flight time is also worth a mention. You can expect around 13 minutes with the DJI Ryze Tello in normal conditions. That’s double a lot of other camera quads in its class. And the 100 meter range is more than enough for a small model. The onboard camera can take 5MP aerial stills and shoot 720P video at 30fps (frames per second). The lens has a field of view (FOV) of 82.6°. The footage won’t take your breath away but it’s surprisingly good considering the camera specs. The quad has two antennas and electronic image stabilization. Combined, these things make the video transmission and footage smoother and more stable. Best of all is that you can share the footage on social media straight from a smartphone. The drone is also compatible with virtual reality (VR) headsets for the ultimate First Person View (FPV) experience. This fast and affordable camera drone puts the pilot firmly in the flying seat. It’s a great first craft for kids and anyone else who wants to improve their flying skills before moving on to costlier quads. The makers of the UDI 818A quadcopter suggest supervision for children under the age of 14 years. Younger kids love to fly the UDI 818A once they get to grips with the controls. The design of this kid’s drone is minimal to the extreme. That might sound like a criticism but it’s not. The fewer distractions there are the less a newbie pilot has to worry about. This drone sports big rotors that are widely spaced apart. It’s a design that makes flights more stable than smaller crafts. Despite its size, though, it’s still very light at just 131g or 4.6 ounces. It’s not the best flyer in blustery conditions so be cautious about taking to the skies when it’s windy. On calm days you’ll find it quick, responsive to controls, and really easy to maneuver. The UDI 818A quad comes with two simple flight modes. Beginners will want to stay on Low Mode until they get more confidence. The High Mode is where you can experience quick climbs and fast turns. Kids love to impress with acrobatic flips and rolls and this drone doesn’t disappoint. For fancy flying use the 360 Eversion Key and control those moves with the simple push of a button. The chunky looking UDI 818A 2.4 GHz controller is straightforward. It feels quite nice in the hands and the markings on the buttons are clear. 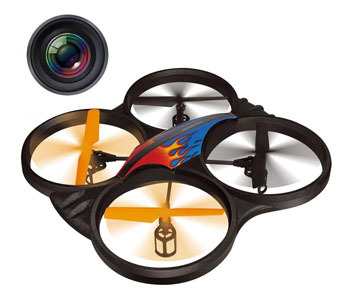 It’s equipped to control the camera, stunts, and flight modes. The controller also has a digital LCD display that shows the throttle setting. 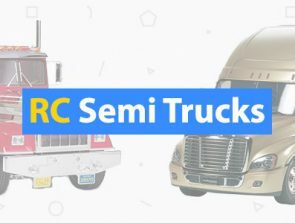 You can even turn the LED lights on and off from the RC. Let’s now take a look at the camera capabilities. The 720p HD camera is small, flat, and light. It attaches to the drone’s body and connects via thin power wires. The 4GB MicroSD Card (included) stores all the aerial stills and video footage. The video quality is more than ok for a drone in this price range. The upgraded 1080 x 720 resolution @ 30fps is better than a lot of the cheaper camera drones in this class. The maximum flight time is 9-minutes. The bonus battery that comes with the UDI 818A Discovery effectively doubles your flying fun to 18 minutes. You may still want to invest in one or two extras. The long battery recharge time is disappointing. It can take between 90-minutes to 2-hours to fully recharge. Compared to a lot of other drones that’s quite long, hence the suggestion for extra batteries. The control range is 30 meters (98 ft.). This is on a par with most of the kid’s drones in this guide. It’s important to always keep any entry-level drone in the line of sight (LOS), especially the tiny ones. A lot of drones are fully-autonomous but this one gives more control back to the pilot. 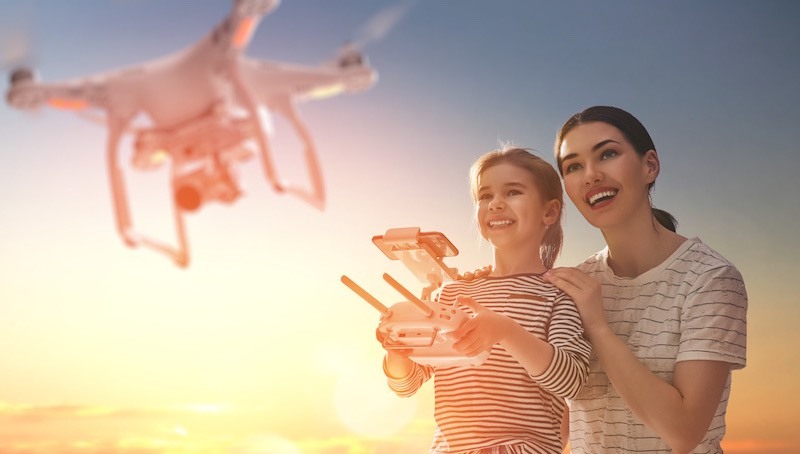 Any kid who wants to learn how to fly a drone—rather than just watch it fly—should consider the UDI U818A. It may not be the best drone in windy conditions but it flies beautifully in good weather. It stands up quite well to crashes too. And there’s always the spare set of props if you damage the blades. The quick tech specs along with pros and cons in the table below should help you decide. 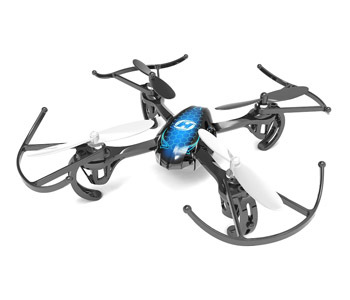 The Haktoys HAK907C is a kid’s drone that looks a little different from the others. It’s also a camera ready drone. There’s no inbuilt camera but it comes with a camera kit and an assembly manual. The recommended age for flying the HAK907C unaccompanied is 14 years. It’s a perfect choice as a child’s first drone. The makers have reduced the price in recent times making it even better value. It’s a ready to fly (RTF) drone so you just need batteries for the transmitter and you’re away. This little drone flies like a dream. More good news is that it’s super-easy to learn and handle. The not so good news, though, is that it’s not as wind-resistant as some others in its class. Almost everyone who flies the HAK907C enjoys the experience. You’ll soon spin through those thrilling 360° loops and showoff turns with a little confidence. It’s what you might call a spirited performer. There are three different speed modes: 30%, 60%, and 100%. Other flight features are the 6-axis gyroscope. This has auto-stabilization to keep the craft steady in the air and reduce camera shake. This drone is probably too big for kids to fly in the home even though it’s lightweight. It’s okay to practice vertical takeoffs and touchdowns indoors but that’s about it—unless you’re highly-skilled. 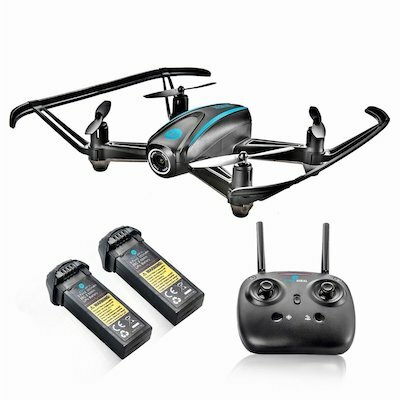 The Haktoys HAK907C has quite a sophisticated remote controller (included) for an affordable drone. The controls to maneuver this powerful quad include elevator, aileron, throttle, and rudder. This drone flies up to 91m (300 ft.) from its controller. The other drones we’ve looked at so far could only manage 30m. The maximum flight time of 10 minutes beats all the previous picks too. It falls short on the battery recharge time, though. At 90 minutes it’s double that of some of the smaller craft. If you want more flight time then invest in one or two extra batteries. There’s a lot to like with this drone not least because of the recent price drop. If you’re looking for a capable and user-friendly craft for your kid to learn with, look no further than Haktoys HAK907C. It flies well, comes camera-ready, sports some intuitive controls, and has kid-friendly flight modes. The camera drone in this category is mostly for older kids—14 and above. These are great options if you want a more powerful drone that will last longer. The Altair Aerial AA108 is a capable camera quad that’s ideal for kids and advanced pilots. The three flying modes and one-button takeoff and landing get youngsters off to a confident start. The Altair Aerial AA108 is a proper camera quad suitable for younger pilots on a mission. It rewards kids with an immersive First Person View (FPV) flying experience. The best part is that newbies can take it easy and learn how to fly this puppy at their chosen pace. You can switch to Mid-level and finally Advanced flying when it’s time to leave Beginner’s mode. That’s three levels in one drone. The list of features above are things you’d expect to find on much costlier camera quads. 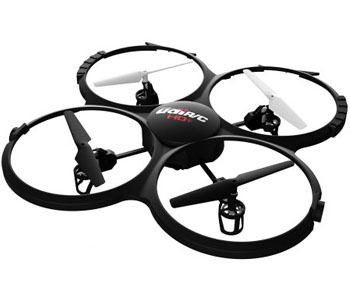 This feature-packed drone is an excellent choice for kids because it acts as a training craft. Its flight range is around 300 feet (100 meters) which gives young pilots a decent ride. And there are low battery and out-of-range alarms to make sure they don’t lose their new Aerial AA108. The Aerial AA108 includes a 720P, 120° wide-angle camera that takes good stills and video. The camera lets you see what the drone sees from a smartphone screen. FPV blows young pilots away and gets them excited about flying camera quads. The remote controller has a clamp that holds most regular smartphones in place. By the way, you don’t need a smart device just to fly the AA108. You do need a smartphone to fly in FPV, though. You also need the phone to draw a flight path for your quad to follow. The smartphone and FlyingSee App by UDI RC add extra features. It’s probably better to fly using only the controller at first. FPV is something best suited for intermediate and advanced flyers. There’s more to experience with this drone as skills develop, and that’s the point. 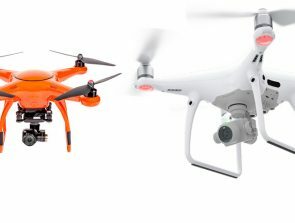 It’s hard to find fault with the Altair Aerial AA108 camera drone when comparing it to similar products. The only real bummer—as a learner quad for kids—is the short 8–10-minute max flying time. There is a bonus battery included so that something at least. And battery charging time only takes around 45 minutes when done at room temperature. Another minus is that the drone doesn’t fly well in the wind. My advice is to avoid winds over 10 mph. You can always fly this lightweight drone indoors if the weather’s bad outside. Just make sure you know how to control it before you do that. The final gripe is that there’s no camera stabilization. The camera’s stills and video footage is good but far from exceptional. Still, we can’t expect cinematic quality for a quadcopter in this price bracket. The large Parrot AR. Quadcopter 2.0 Elite Edition is a smart and very capable quad. It’s popular with pilots who are ready to take their flying and aerial filming experiences up to the next level. The minimum age suggestion for operating this UAV is 14 years and older. The only way to control it is with Wi-Fi and the FreeFlight Piloting app. That means you have to fly it using a mobile device. There’s no remote control option available. This is why it’s better suited to older kids who are more familiar using smartphones and tablets than most preteens. This drone is available in three camouflage styles: jungle, sand, and snow. There are a few things to do before you can take to the skies with the AR. 2.0 Elite. The first thing is to download the FreeFlight Piloting app to your iOS/Android smartphone or tablet and then set it up. Setting the mobile app up is straightforward but take your time and follow all the instructions. Impatience causes more upsets with drone configuration and flights than anything else. It’s important to fine tune the settings to get the best experience. These include altitude, rotation-speed, and a few others. I won’t go into details here as you’ll have the instructions to guide you. Once you’ve set up the app, connect the mobile device to the crafts Wi-Fi signal. The FreeFlight app is really easy to use. Even so, make the maiden flight using the slowest and lowest modes possible. Once you hit the ‘Takeoff’ button the AR.Drone obeys the command and takes off. It then hovers a few feet above ground level (AGL) and steadies itself with a series of smart stabilizing adjustments. Flying is fun and easy once you get to grips with it. It may take a while to become familiar with all the smart features & functions. Then you can perform all those fancy front flips, side-flips, and back-flips. The fixed 1280 x 720p HD camera does not produce outstanding quality but it’s more than decent. Most users are happy with the stills and video footage for a drone in this class and price range. You can do a lot with this camera: stream live video to your smart device (SD) or save HD video and still photographs to a USB flash. Be sure to take some time to explore all the camera options. Parrot claims a 12 minute maximum flight time with the 1,000mAh battery (included). The reality is more like 9-10 minutes per charge. It’s always a good idea to carry more than one charged battery. The battery recharge time is somewhere around the 90-minute mark. This isn’t extreme but it’s on the long side of average. And potential flight range is 50m or 165 feet depending on the WiFi signal. 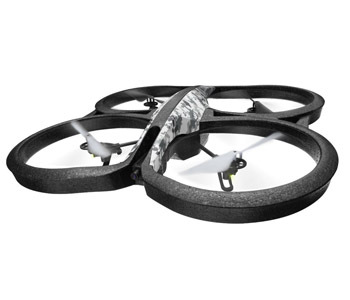 The AR.Drone 2.0 Elite Edition provides an incredible experience for qualified pilots. It’s the most difficult quad to master in this guide but it’s easy for anyone with some prior flying experience. It has its downsides (see cons below) but then so does every other drone. Overall this is a fun camera drone and it’s huge in size compared to some of the nano and micro options we looked at earlier. It flies beautifully and keeps itself steady. 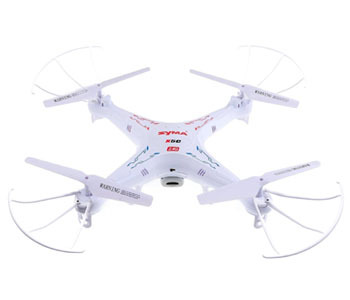 It can perform a few impressive stunts and can take photos and record video from the sky. And the FreeFlight app is both well-thought-out and functional.